When East Meon was chosen as ’The Domesday Village’, a Committee was formed to agree a strategy to cope with the expected numbers of visitors. The minutes book is in the Library, E/8, and a PDF can be downloaded, below. 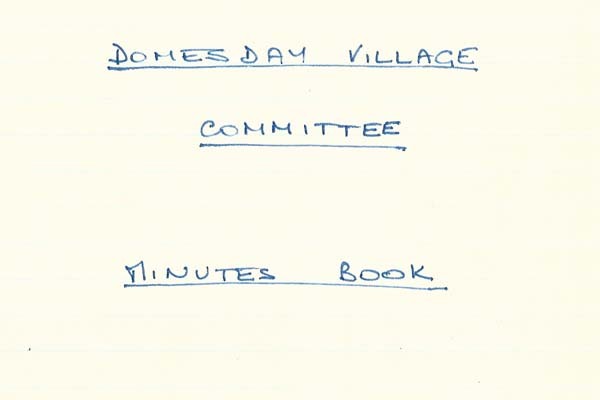 The second PDF is a letter from East Meon resident, at the time, R.H.G.Faber, to the Charity Commissioners, following a suggestion by the Committee that this would be a suitable vehicle for the managing of the Domesday Village project in East Meon. A third PDF is a letter to the Charity Commissioners, February 1986, written by Bobby Faber, requests permission to establish a Charitable Trust ’to administer the monies received and to distribute them for the benefit of the village and its institutions’. Letter from Bobby Faber to Charity Commissioners proposing the establishment of a Charitable Trust. Letter to Charity Commissioners, Feb 1986, requesting permission to establish Charitable Trust.